They're cute, cuddly, clean & well groomed. They live in a cage that is lovingly bought & ornamented for it. They run on a treadmill with their all so adorable little legs. Every time I enter my hamster cage, the only thing I do is work on the treadmill. 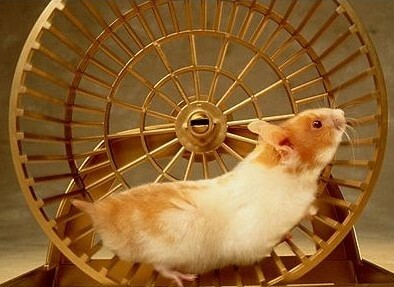 And just like a hamster treadmill, there is no end to the work. It just goes on and on and on... and on. The faster I can run, the faster the treadmill will make me run. I cannot leave my cage. Hamsters need to unplug at a non-work environment. But there're just these four invisible walls. I am thinking of some changes.